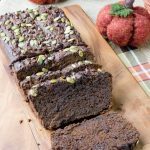 This Keto Sugar-Free, Low Carb but Nut Free Chocolate Pumpkin Bread is gluten free and grain free as well! 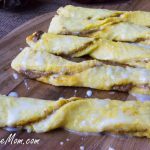 It’s the season for all things pumpkin and the combo of chocolate and pumpkin in bread form has always and will continue to be the worlds best of the best of the fall recipes! You just can’t beat the combination. 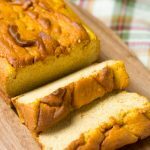 The pumpkin adds just a small hint of flavor but adds just moisture and softness, almost the same texture as a banana bread, it’s hard not to love it. 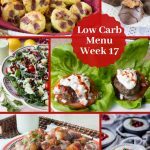 Making it low carb, gluten free and also grain free was no easy task! I’ve had to experiment with the amounts of of everything from the butter, sweetener to the flours used. Six times was the magic number because I wanted it to be my very best recipe. 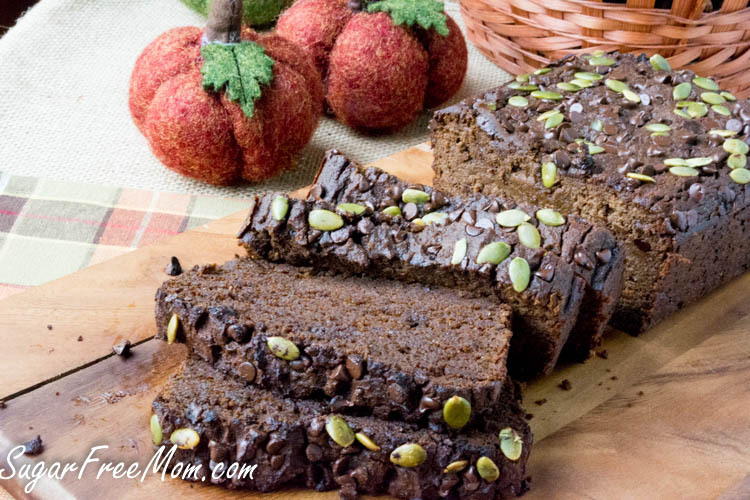 I wanted to show how fabulous a pumpkin bread could be using non traditional ingredients. My ingredients of choice also need to be nut free, another difficult task in the low carb baking world. Embracing coconut flour has been the hardest skill I’ve had to tackle but once I finally get the best, it’s a task well worth my time and effort. Super moist and full of chocolate and pumpkin flavor. My youngest son who has the tree nut allergy is not a fan of anything flavor of coconut. He is also the greatest detector of coconut in my recipes and a tough critic. He loved this bread and could not taste any coconut flavor. The other ingredients are the star in this hearty and dense bread. Toast it with butter or top with some sugar free whipped cream. You could probably even turn these into muffins! Whisk the first 8 ingredients together. Set aside. In a stand mixer add the eggs and pumpkin and blend until combined. Add remaining ingredients except optional toppings. Once combined pour in half the dry ingredients into the stand mixer and blend until incorporated. Add remaining dry ingredients and blend until combined well. Pour batter into a parchment lined 9 by 5 loaf pan. Top with optional toppings if desired. Bake for 50-60 minutes until a toothpick in the center comes out clean. Allow to cool for 15 minutes then remove onto a wire rack to finish cooling. 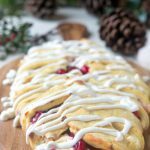 This recipe was originally posted in September of 2016 and updated with video in 2018. If you use another granulated sweetener other than Swerve, I would suggest omitting the liquid stevia. Swerve is less sweet than most granulated sugar free subs. I have tried using Sukrin brown sugar sub and it was actually not as sweet as using the Swerve sweetener. 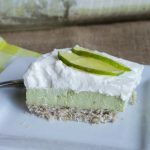 I tried this without any liquid stevia, using both Sukrin and Swerve and neither had enough sweetness on their own. I've made this 6 times using different amount of coconut flour, cocoa and flaxseed. This is the perfect texture. Replacing the coconut flour with almond would not be equal to replace each other. 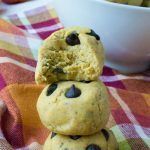 I have not tried this using almond flour since my youngest has a tree nut allergy. I've not tried subbing the butter but I do think using avocado oil or coconut oil would work as well in place of the same amount of butter I used. Do you need a sweetener? I did as did my kids! 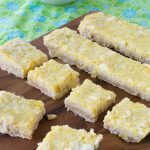 I’ve tried this with half cup granulated sugar free sub and it lacked much sweetness at all. I know, it’s August and I’m baking with pumpkin! It’s so healthy I use it often: For the sweetener, I used half cup Erythritol, half cup Polydextrose, tsp chocolate stevia, subbed sukrin gold for the maple extract, and a few drops of sucralose (EZSweetz) to taste. The only other sub was half cup coconut oil for the butter. It took exactly 60 minutes to bake. It is so moist between the PolyD and pumpkin, my DH said it was like a brownie with more substance. Yes, I will make this year round! Thank you Brenda, I love your recipes! Looks delicious, can’t wait to try. Which kind of swerve are you using? I have the powdered sugar try, is that ok to use or should I get the granulated. Both types of Swerve will work, powdered or granulated. Brenda, I love your recipes! But what I especially like is that when I click “print” it has a picture of the finished product & almost always fits on one page. Some that should fit, take up several pages, sometimes no pic, which is annoying. It’s a little thing, but most annoying things are! Thank you for all you do! I LOVE THIS RECIPE, BUT WHEB I CLICKED PRINT, 18 PAGES. FAR TOO MUCH INK AND COLOR LOST TO ADVERTIZING. ENJOY YOUR SITE. PAT PS WHERE DO I FIND LIQUID CHOCOLATE STEVIA. MY FOOD MARKET ONLY CARRIES ONE TYPE OF STEVIA, POWDERED AND NO CHOC. FLAVOR. DARN IT. I WILL PUT EXTRA COCOA IN OR BUY SOME CHOC. EXTRACT. I have a flaxseed intolerance. Substitution ideas? Thanks! I made this last night following the recipe exactly, but it is very crumbly. Even after letting it cool in the pan for 15 minutes, the bread fell apart. I softened the butter. Should the butter be melted? Thanks for the purchase info on chocolate Stevia. I found every flavor except chocolate. OK OMG THAT WAS DELICIOUS! I did sub the sugar for a different sweetener and next time I’ll have to add a little more but I’ve noted it because I will make it again. Love your blog and enjoy your recipes. 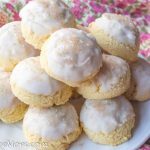 I’ve been sugar-free for 5 months now and I can’t see going back but needed to find a great site like yours. Thank you so much!! So happy you liked it, thanks for coming back to share! Made this last night – just wanted to share how amazing it turned out! I only had 12 oz of pumpkin puree but took a chance and it turned out wonderful. I also used granular erythritol vs. Swerve because that is what I had on-hand. I did notice the erythritol, it made it a bit grainy feeling, so I will definitely powder it in the Magic Bullet for next time. I also used vanilla liquid stevia as that’s what I had and 1 tsp vanilla extract b/c I didn’t have maple. Added 1/2 cup sugar-free choco chips (Krisda brand). Mine took a bit longer to bake – 1 hr 15 mins. My bread was not crumbly at all, very dense and moist and delicious. Thanks for the great recipe! Your recipe is good timing for Halloween. 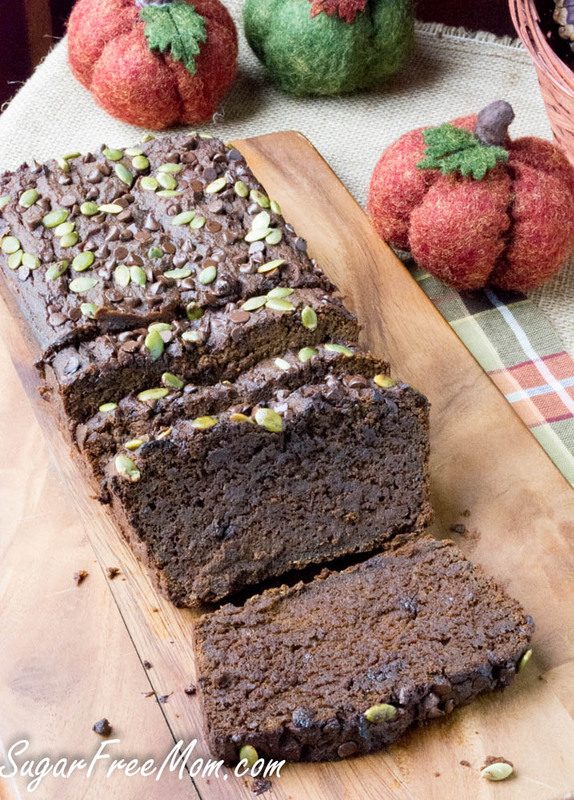 We have lots of pumpkins here so might have to give your chocolate pumpkin bread a try. Good thing it’s low carb, sugar free, as well as gluten free. Thanks for sharing! Just made this tonight. I put it in a larger baking pan (11×8) and it bakee up at about 2.5 inches thick which is perfect. It came out like cake brownies. Moist with lots of chocolate and pumpkin spice flavoring. I didn’t have chocolate stevia but I added a few teaspoons of sugar free chocolate syrup. I already ate 3 pieces. This could be dangerous for me the next few days. Lol. I will probably have to freeze half the pan so I don’t go too crazy. Very pleased worth the flavor. Wonderful recipe. This is such delicious bread! Thank you for all your yummy recipes, your recipes have blessed our family tremendously! It feels good making food in a more healthier way and not feel guilty about eating it! I do not have flaxseed meal but always have ground flaxseed on hand. Think it would turn out OK just using the ground? Yep I think it would still work for you. God Bless you for all that you do for your family and the community of people who have difficulty with their food intolerances/sensitivity. I just found your site and I love it. 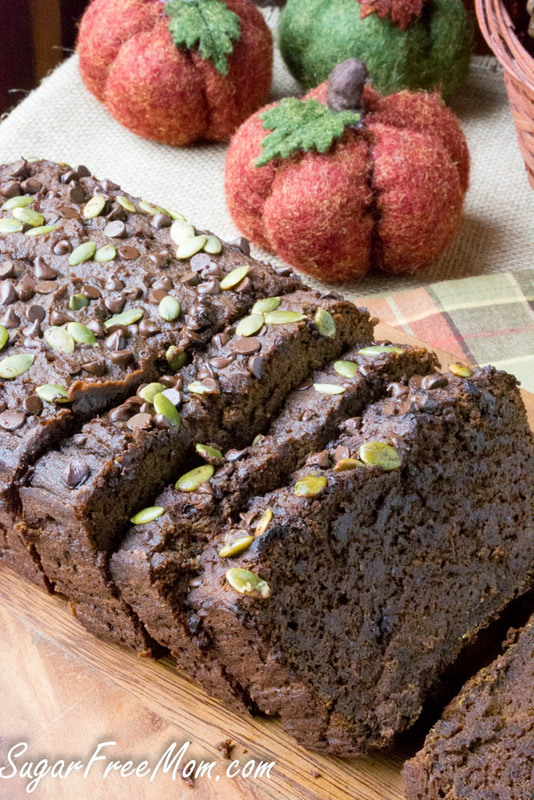 I am going to try this pumpkin chocolate bread. The question I wanted to ask is: do you know what the ratio of ingredients would be if I used Almond Flour? Would I still need to include the ground flaxmeal? cause I know you had to adjust the recipe because you needed to use coconut flour instead of Almond flour. Just wondering. Thanks so much. Thanks Grace! I would say you could swap out the coconut flour and the flax for almond flour but I would also add an additional 1/2 cup more. Thank you for a beautiful pumpkin bread recipe. Made this tonight for my family and the kitchen smells divine. It tastes even better. I tried this chocolate pumpkin recipe, a little reluctant, because I love the distinctive taste of pumpkin and chocolate! 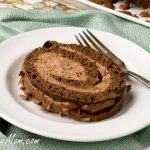 It turned out super moist and good, but I’d like to try it next time without the chocolate! Would that work, or do I need to add something in place of the quarter cup of cocoa? Must take this opportunity to thank you, Brenda, for all that you share! 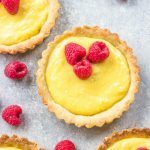 So interesting and helpful for those of us who won’t/can’t do sugar and want to do Keto! Love your website and emails! 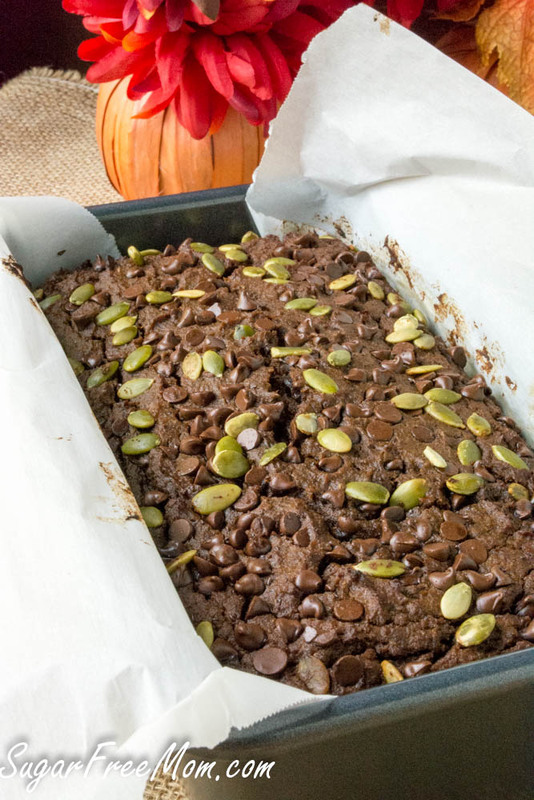 I’m actually enjoying the taste of the chocolate/pumpkin loaf, Brenda, but I’m still wondering if I decided to try this recipe without the chocolate, what could I use to replace it with so that I could get just a pumpkin taste? This recipe is fabulous, but I’m yearning for just pumpkin now! Thanks Brenda! 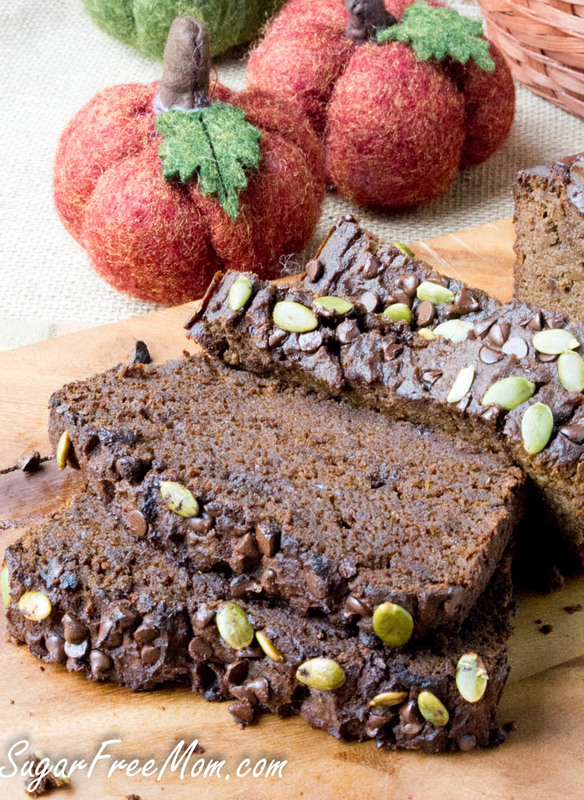 There is always a healthy alternative, and chocolate pumpkin bread seems like a nice balance. Super good! I made it again today and used a can of Trader Joe’s butternut squash. My oven may not be true to temp as it takes 1 hr 15 min to cook. I also sprinkle a little Swerve confectioners on top and I imagine a little Swerve sweetened whipped cream would be amazing. Thanks again! We love it! Highly recommend your blog to everyone. 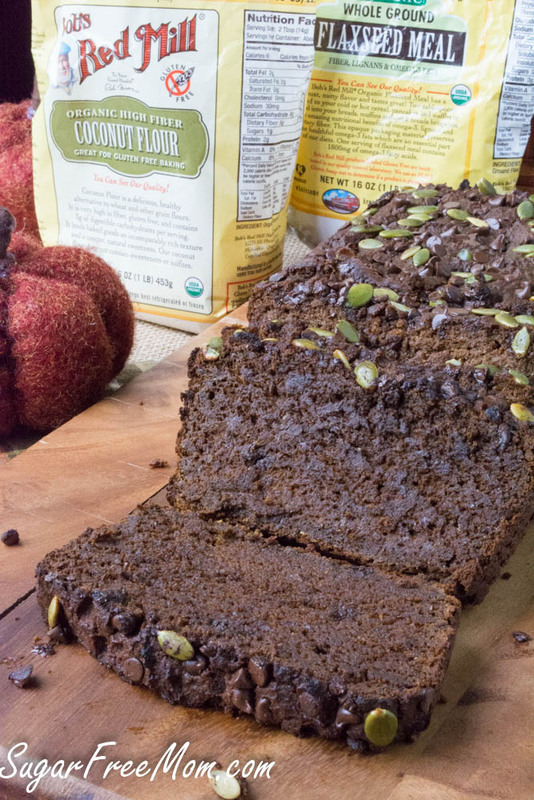 Especially this beautiful pumpkin bread recipe really made our day. Made this for my kid’s tonight, they loved it. The taste is lovely and delicious.